Porcelain sinks can last a lifetime, but after years of use the surface may be marred with stains, chips and scratches. 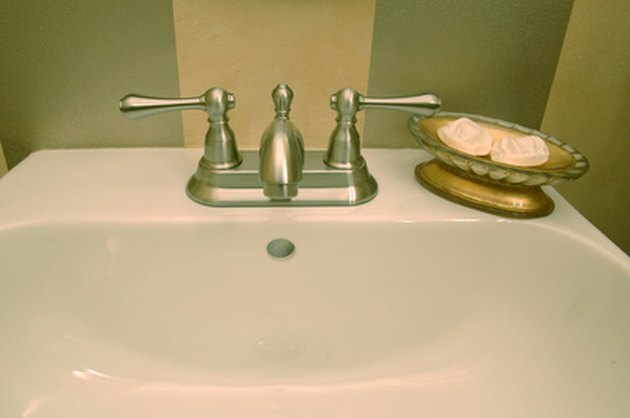 While you could replace the unsightly sink altogether, it is much more cost-effective to simply refinish it. You can also use this task as a redecorating opportuninty and change the sink's color to match your current decor. The materials necessary for refinishing a porcelain sink are do-it-yourself friendly, so any competent handy-person can manage the project herself. 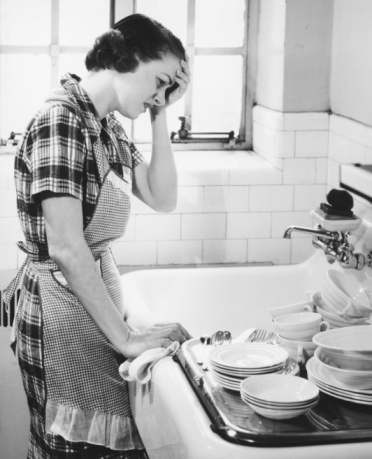 Clean the sink with trisodium phosphate, applied with a soft cloth. This chemical -- or an environmentally friendly TSP substitute -- can be found in any hardware store and will clean off accumulated dirt, old soap scum, and other residue from the porcelain sink's surface. Cleaning the surface will ensure the epoxy primer will adhere. Attach medium-grit sandpaper to the clamps on a hand sander and thoroughly sand the entire surface of the sink, even the edges. This will create a rougher surface so the paint will adhere better and will also smooth out minor scratches and small chips. Smooth out the surface with a fine-grit sandpaper. Remove any dust or debris with a damp cloth. Evenly apply a thin coat of bonding agent with a cloth. Wait about five to 10 minutes for it to dry. Brush on the epoxy primer and evenly apply it all over the porcelain surface. Apply a light coat of the primer, continually moving the paint brush in the same direction to avoid visible brush strokes. Allow about 15 minutes for it to dry. Lightly sand the sink again with fine-grit sandpaper, then clean off the dust with a damp cloth. Brush on a second light coat of epoxy primer. Let it dry for 15 minutes. Apply a thin layer of acrylic topcoat to the sink with a high-quality brush. Again, always brush in the same direction. Wait for the first coat to dry before applying two more thin layers, allowing time to dry between each coat. Let the sink dry for 24 hours before using, and do not heavily use for 5 days.